Note Edge: How do I format the microSD™ card in my Samsung Galaxy Note Edge? Warning: Formatting your microSD™ card will remove all personal information from the card. This information cannot be recovered. 4. Touch Format SD™ card. 5. Review the message about data and touch Format SD card again. 6. Touch Delete all to complete the formatting process. Note: You must unmount a microSD card before removing it. 4. 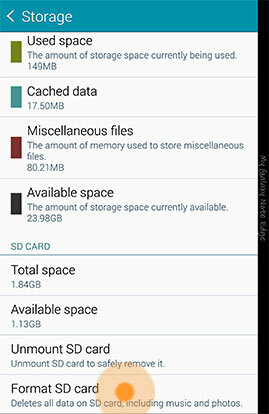 Touch Unmount SD card. 5. Touch OK to finish unmounting the card. 6. Gently pull the cover off the device, using the slot on the top. 7. 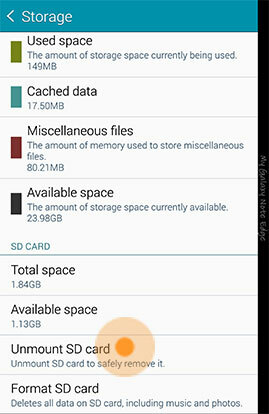 Grasp the microSD card and remove it from the device. Note Edge: How can I change the font style and size on my Samsung Galaxy Note Edge? Note Edge: How do I use Action Memo™ on the lock screen of my Samsung Galaxy Note Edge?